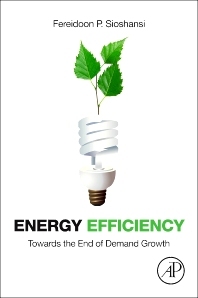 Energy Efficiency: Towards the End of Demand Growth is a detailed guide to new energy efficiency technologies and policy frameworks affecting the profitability of efficiency projects. The contributions drawn together by F.P. Sioshansi feature insights from recognized thought leaders, detailed examinations of evolving technologies, and practical case studies yielding best practices for project planners, implementers and financiers. This volume challenges the "more is better" paradigm in energy production, examining efficiency technologies and measurement across the supply chain. Primary: Systems, Power and Electrical Engineers, regulators and business professionals working at electric utilities, and on power systems. Secondary: Policy makers; economists; investors; graduate students & post-grad researchers studying energy production. Foreword. Is Zero Energy Growth in Our Future? Chapter 1. Will Energy Efficiency make a Difference? 3 What Scope for Energy Efficiency? 3 Why Do Utilities Invest in Energy Efficiency? Chapter 5. Is There an Energy Efficiency Gap? Chapter 6. Making Cost-Effective Energy Efficiency Fit Utility Business Models: Why has It Taken So Long? Chapter 13. Crouching Demand, Hidden Peaks: What’s Driving Electricity Consumption in Sydney? 2 Where have all the kWh Gone? 3 How Big is the Energy Efficiency Resource? Chapter 18. What Comes After the Low-Hanging Fruit? Chapter 20. Energy Efficiency Finance, A Silver Bullet Amid the Buckshot? Chapter 22. Trading in Energy Efficiency – A Market-Based Solution to Market Failure, or Just Yet Another Market Failure? 4 Does Customer Engagement Matter? Epilogue. How Do We Get There From Here?